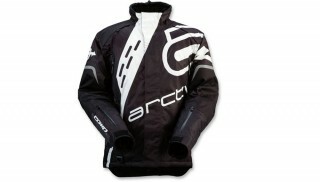 Arctiva says its new men’s Comp insulated line is a performance blend of race-inspired design and all-weather comfort. 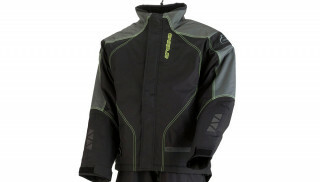 The Comp insulated jacket is fully insulated, with a chassis created from a breathable, durable, waterproof and windproof high denier polyester, and a hanging polyester liner. This two-layer laminated fabric is sealed at the seams, with 600D polyester Oxford overlays in the wear areas, and a DWR coating. As well, the jacket is insulated with 3M Thinsulate insulation in the front, back and sleeves, and fleece lining the two hand warmer pockets and the collar area. Climate control comes from strategically placed zippered air vents and adjustable cuff, collar and bottom hem. Specially placed retro-reflective graphics are designed to keep you visible and safe into the night. The men’s Comp insulated bibs are made from the same polyester material as the jacket, with 3M Thinsulate insulation throughout the interior. Interface connectors secure the jacket and bibs together. Oxford overlays are located in the wear areas, as well as a double layer of material and waterproofing in the seat of the bibs. The bibsfeature the same breathability as the jacket with full length zippered air vents on the inner and outer thighs, and a removable bib. Side waist adjusters and adjustable inseams give between 1.5” and 3” of growth. Interior cuff gaiters are designed to help keep the snow out of your boot. Both the men’s Comp jacket and bib are available in multiple colors, including, red, blue, yellow, green, orange, and black in sizes small to 5XL. 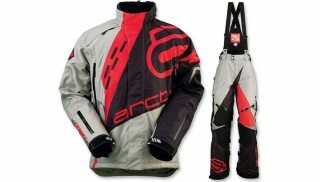 The suggested retail price for the jacket and bibs starts at $230, sold separately. Visit Arctiva.com for more information.